Chicken Trouble is a game developed during the Game Design course, Autumn 2007, at the IT-University of Copenhagen. I was the programmer of the team. The team consisted of four people and was required to create a game as part of the Game Design course. The game is a competitive two player game. 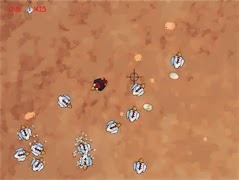 One player needs to fight for the chickens survival in the game while the other player must try to kill a certain amount of chickens before the time runs out. The work effort was not put on the technical side but more on the game design as this was point of this project but it gave a good feel on how to make a game prototype. The game was developed using Game Maker and is free download and play. The attacking player uses the keyboard to control while the defending player uses the mouse.